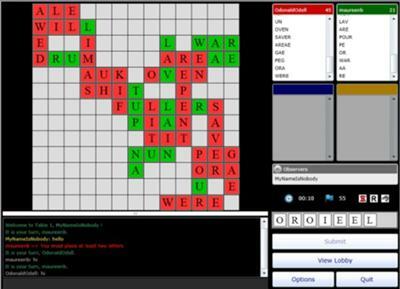 Fundox is a multiplayer word game combining Scrabble and Reversi. It is inspired by Wordox, a game which was famous in the early 2000s but disappeared some years ago. 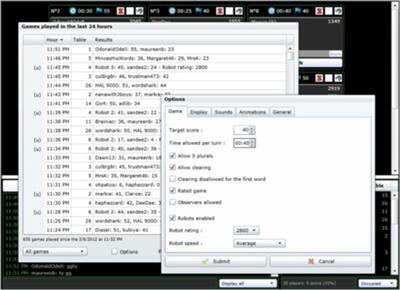 The game is over when one of the players has reached a predefined score, generally between 30 and 50 points. Like in Reversi (Othello) you can steal the tiles placed by your opponents. Each players has is own colour : the first plays red tiles, the second green tiles and so on. 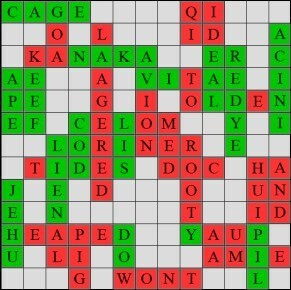 If player A has placed "FILLED" (red tiles, 5 points), player B (green) can extend it with "UN" : "UNFILLED". In this case, the entire word becomes green, player B scores 8 points (he has stolen the 6 points of "FILLED")... and player B loses 6 points. It's hard to summarize this rule without illustrations, it is explained in details here. Because of this scoring, Fundox is much more "aggressive" and tactical than Scrabble and other Scrabble-like games. Tactical errors are very risky. On the other hand, you can become a good player without knowing millions of words, if you play with cleverness. You can play with friends and train yourself against robots using artificial intelligence. The best robot in the French room has a better level than the Scrabble champions who are addicted to the game. 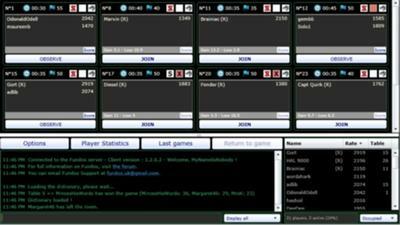 Fundox is developed by a French programmer, for free and without ads. Presently there are around 1,450 regular players in the 3 existing rooms (French, English and German), the community is slowly growing but of course it is very hard to promote the game because it is non-commercial. Join in and write your own page! It's easy to do. How? Simply click here to return to Your Word Game Review.